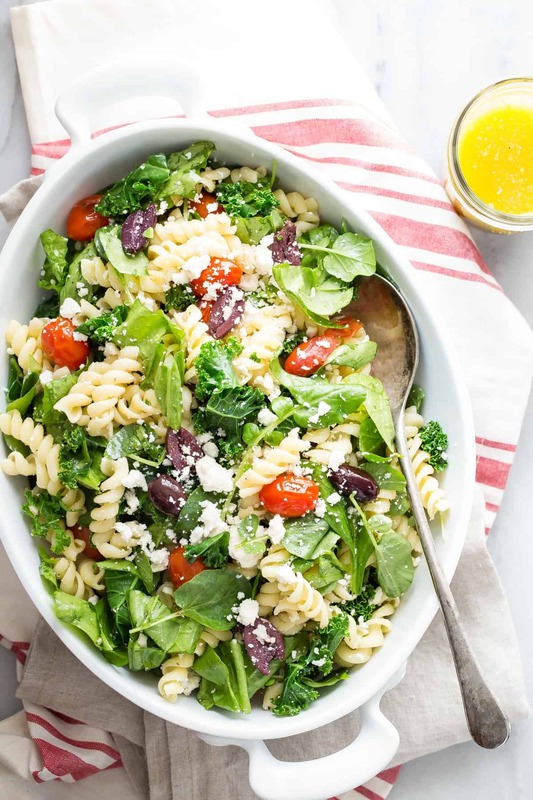 Rotini Pasta Salad with mixed greens, feta cheese, tomatoes and kalamata olives! One bite of this healthy salad will transport you straight to the Mediterranean! Just because summer is almost on its way out, doesn’t mean that we have to start filling our bellies with comfort foods and pumpkin. We can still enjoy salads all year round. Especially if it’s loaded with healthy green vegetables like kale, spinach and watercress. The good thing about the holidays coming down on us at speed is that there’s always a party to go to. And parties usually always need food. 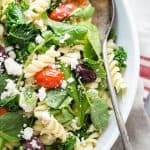 Pasta salads are always an awesome choice, because for one they taste amazing, they travel well and they’re always the first thing to go at the table. October is National Pasta Month or as Dreamfields like to call it, National Healthy Pasta Month. And to celebrate you can find a different pasta recipe for every day of the month! each week will follow a theme, the first being Go Green followed by Spice of Life, Marinara-thon and Fall-ing in love. 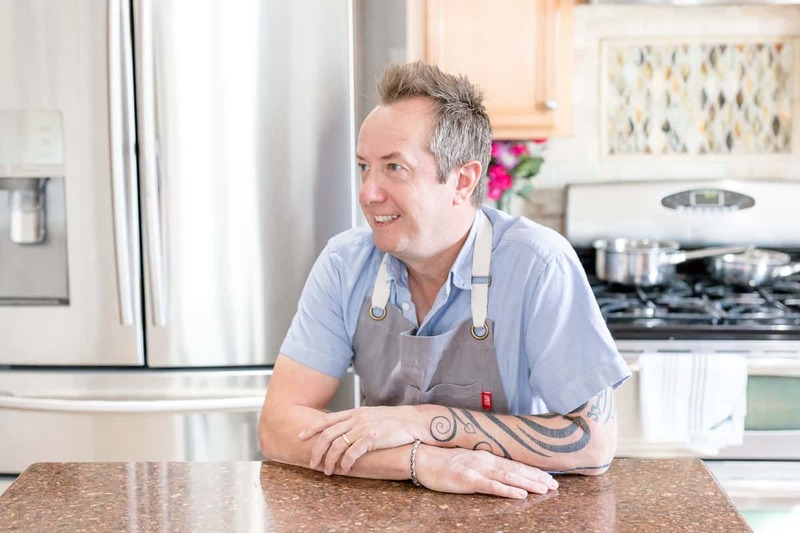 With all this choice there has to be a recipe that’s going to make your dinner choice so much easier in October! 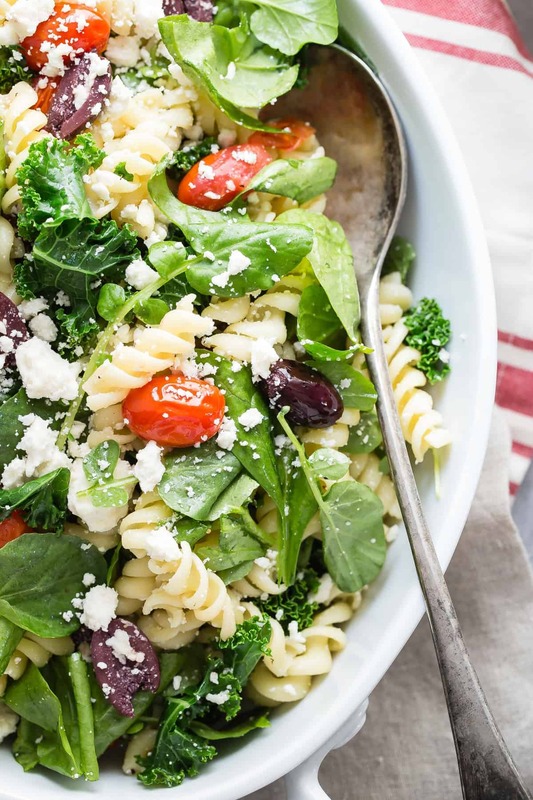 As well as the abundance of greens in this rotini pasta, there’s also roasted cherry tomatoes, kalamata olives and crumbled feta cheese. 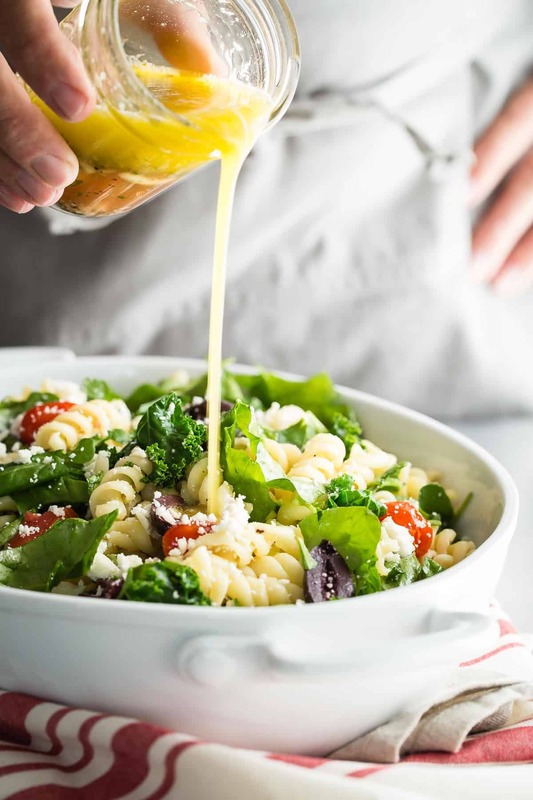 Just when things couldn’t seem to get any better, the whole salad is tossed in a creamy red wine vinegar and basil Mediterranean style dressing. I used Dreamfields Rotini Pasta for this creation. Rotini is the spiral pasta and one of my kids favorites! 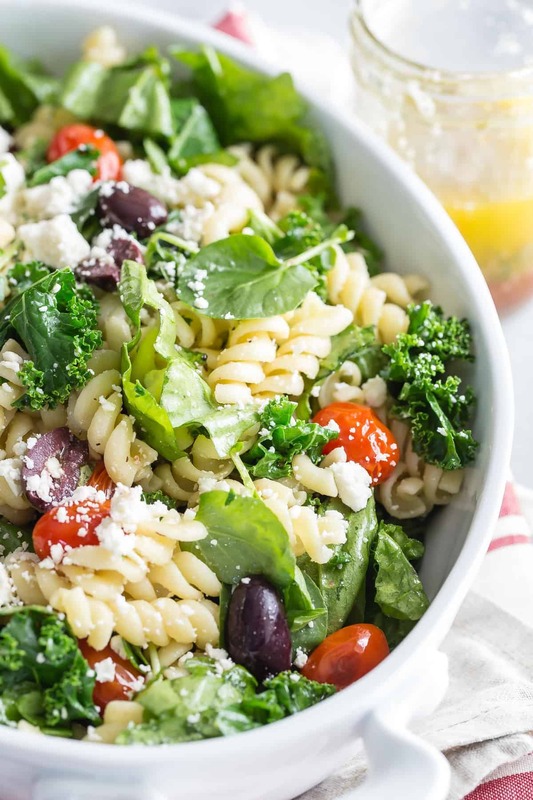 Dreamfields Pasta is made from Durum wheat which makes it higher in fiber and lower in carbs, so not only are you packing great nutrition from all of those greens, the pasta is also on the lighter side! It’s a total win-win. Just to sweeten the deal and make National Pasta Month even more fun, Dreamfields will reward one lucky reader a case of pasta just for answering a simple question. Leave me a comment below about your favorite type of pasta, and don’t forget to visit the list of daily recipes over at Dreamfields for more inspiration! This post was sponsored by Dreamfields Pasta. All text and opinions are always my own! Cook the pasta as per the directions on the box, drain and cool. Heat the olive oil in a large pan and add the cherry tomatoes. Cook the tomatoes over a medium heat until the skins begin to slightly blister. In the same pan, add the water and kale, cover and steam for 2-3 minutes. Transfer the drained pasta to a large bowl. Add the tomatoes, kale, spinach, watercress and olives. In a blender, combine the red wine vinegar, lemon juice, sugar, salt and pepper, garlic, basil and oregano. Blend on high and gradually add the olive oil in a steady stream until emulsified. Add the dressing to the pasta and toss well to coat. Add the feta cheese and add more salt and pepper if desired. Serve at once or store in the fridge until ready to use. Once again, you managed to make just what I’m craving! With a few more mild October weeks ahead, this salad is a must for my lunch rotation! My favorite pasta is the Angel Hair, although I truly love all of Dreamfields varieties! I hope I’m not too late!? My favorite kind is ravioli! !